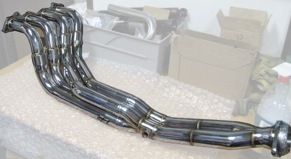 HyTech Exhaust Systems has been developing its street and racing headers for the Honda marque for over 30 years. With the help of some of the fastest drag racers liek, Jeremy Looofsky, Mark Brauning and Stephan Papadakis. We have been able to design and develop the very best exhaust systems that are available today. We work not only with our own dyno facility, but also actual track testing to maximize our exhaust systems. We rely on our 30 years experience in the road/drag racing field to help us design the latest exhaust systems for the Honda and Import market. The name of the game is acceleration, and the exhaust has a big impact in that area, especially on the Honda. These Honda cylinder heads have the potential to flow large volumes of air, unlike most other manufactures. This makes them highly desirable for performance minded enthusiasts. Which in turn lends itself to being heavily influenced by the exhaust system.